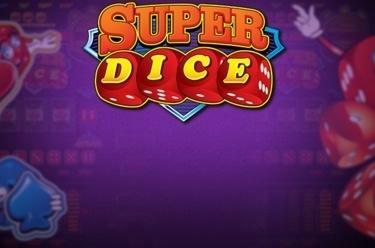 Play Super Dice™ online for free now! 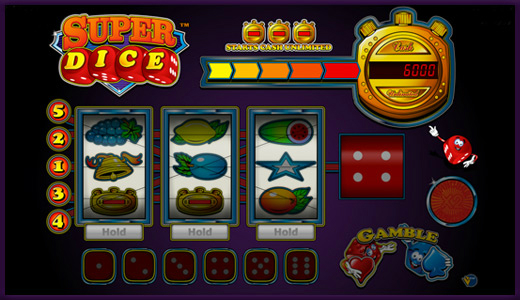 It's not just the fruits, but also the dice which are on your side - buckets of Twists will tumble into your pockets for every three symbol combination you land on a win line in Super Dice™. Fruity winnings await you on 3 reels and 5 win lines; the roll of the dice and the stop watch in the bonus game will reward you with fantastic random winnings! Your aim is to land 3 matching symbols along a win line. Are you one symbol away from a winning combination? Use the ‘Hold’ feature to fix reels in place for the next spin and increase your chances of winning! If you land multiple winning 3-symbol combinations on various win lines, all winnings will be added together. Land 3 dice symbols anywhere on the reels to trigger the Dice Feature. Dice feature: Land 3 dice symbols anywhere on the reels to trigger the Dice Feature. Click on ‘Stop’ to roll the dice. Depending on the number of points you roll with the dice you win 1 to 6 win spins - every spin wins and you don't have to bet! Cash Unlimited Feature: The stop watch to the top right of the screen will show a new win amount with every spin. If you land 3 stop watch symbols along a win line, you will win the Twist amount currently shown on the stop watch! Ingredients for the perfect slot? Fruits and dice!